Reports are emerging from Toronto this afternoon regarding a prolific local knitter who used to really get sh*t done, but in recent weeks has finally come to realize that no matter what approach she takes, how many lists she writes, or how precisely her schedule is organized, there inexplicably remain only 24 hours in a day, and each of them only have the standard sixty minutes, no matter how many post-it notes she sticks to the wall above her desk. Witnesses claim that the complete dissolution of a system that was barely working began two weeks ago when the knitter became a grandmother. “I don’t know what she was thinking” said a source close to the knitter. “I mean, you can’t just add a whole other person to your life and not take a couple of the post-it notes down, you know what I mean? She just kept saying it she could fix it with organization, but I think that she’s in over her head. The baby, the Bike Rally, the Retreats, The Knitter’s Frolic thing… She’s going to lose it.” The source went on to report that the knitter had snapped the evening prior while serving bagged salad and dry toast for dinner, claiming tersely that it still counted as a meal and mumbling that the source was lucky to get anything, and to hang up his towel after he uses it because they are (*&^%ing out of clean ones. As we have come to expect from previous encounters with this knitter under stress, housekeeping went first, and the knitting has been the last thing to go. While dust bison roam the knitters home, everyone is out of clean clothes and a smell that has gone past “weird” and into “disturbing” continues to emanate from the fridge, itty-bitty knitted things pour forth unabated. 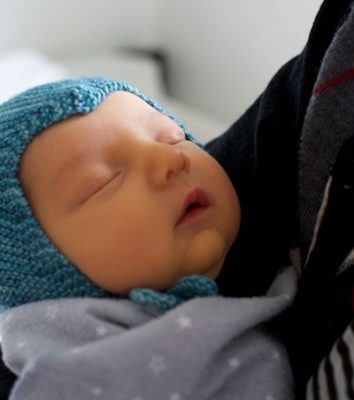 This tiny hat followed the realization that the new baby was indeed too tiny to fit the things knit for him during his gestation, but that the weather had not yet turned, and he would need something on his head. A pair of bootees followed immediately thereafter, because his feet looked cold, and he didn’t match, and despite the absolutely impossible level of chaos in the knitter’s inbox and on her desk, that seemed like a priority. When last heard from the knitter in question was typing frantically at her laptop, with her life in tatters all around her, softly mumbling “next week I’m going to get all this together” while her family stood nearby, shaking their heads gently. We attempted to reach the knitter for comment, but all we received was a reply was an email that read “Isn’t he the most darling thing ever?” and the attached baby picture. This would have been more annoying, did this news outlet not agree that he is freakin’ adorable. We will continue to follow this story closely. More pictures please! All the other things will come together (or not) but time with and knitting for him, priceless. When there’s no more salad bag maybe there’s oatmeal. Chubby stubby adorable. Enjoy. Wish you could send along a sniff of baby head. He is ABSOLUTELY adorable — and I would certainly forgo housekeeping to just hold him and look at those widdy bitty feetsies!!! Oh dear Lord, that’s one heck of a cute baby! I completely sympathize with allowing such a cutie to turn your life upside down– babies just do that to us, you know? Well, you know it takes about six weeks to integrate a baby into the life of a family. If said knitter does get her act together by next week, she will be well ahead of schedule. Wishing her all the best as she picks the right priorities. …and I’ve got Lion King soundtrack running through my head on that last adorable pic. Yes!Yes!Yes! Please continue following Elliot. He is so freaken’ cute and I can’t get enough. Amazingly adorable! Thank you for the extra pics, we can’t get enough!! Also amazing how many schedules are thrown asunder when a new little one arrives! Enjoy each precious moment as only a grammy can! Awesome post. More awesome baby decked out in his handknits! very beautiful. Enjoy him every minute and forget the housework-it’s overrated, babies are not!! This reader thinks the knitter in question has her priorities in the correct order. After all, that absolutely astoundingly superb baby will only be a baby for a brief time and must be enjoyed NOW! Those other pesky things like laundry and weird smells and to-do lists and dust bison will be around till doomsday. And anyway, aren’t there 2 people in said knitter’s house who can open bag salad and make toast?? I wholeheartedly second this comment! Remember how it took a while to be a parent? Well same with grandparenting. Especially a knitting Type A one that is self employed, gives her time generously to her family and friends and great organizations, and some how makes enough of it work. Hang in there. We love baby pictures especially when the cutie is wearing hand knits. Congrats to all! He is indeed adorable! God Bless! I got to touch the Clock, which is an excellent reminder that infants grow into babies who grow into toddlers who grow into children who morph into teenagers who turn out, quite amazingly, to be adults, all in an astonishingly short period of time (in hindsight). Enjoy each time for what it is, and when it is. Other things will always be waiting for you. And it’s not just you, he IS frickin’ adorable! Oh goodness, you are totally smitten, aren’t you? Beautiful beautiful baby. Megan is obviously doing a wonderful job. I say this knitter has it just right – he is absolutely adorable and fully deserves to be a priority, and yes, housekeeping always goes first! Those cheeks make me think of velvet and have me wanting to go into town in search of a baby to kiss! So who needs housework? Priorities look straight, from over here! If I lived in Toronto, I’d offer to help, probably couldn’t do shopping for groceries, but I’m awesome at laundry. Could you hire someone to come in and vacuum everywhere, clean bath and scrub kitchen floor and sign a pledge that they will never tell anyone how big the dust bison were. You will never regret one moment spent holding that beautiful baby. Had to touch camera, hope that means more pix. too many baby pics? never heard of such a thing!! Absolutely agree….more pics in handknits!!! He’s too too cute! I know! I’m not in any way feeling that there are too many baby pix. More, I say!! I am madly jealous, since my daughter grew up to do many amazing things, but with no desire to produce a grandchild for me. But I DO have a ton of great-nieces and nephews, and please could you give us the name of the hat pattern? I’m sure I had it once, but I can’t remember the name. And yes, he is every bit as adorable as you and your family think he is! The hat pattern is Bouncing Baby Set (Homespun, Handknit, 1987, pp.80–83). The reporter is mistaken, no illness has been caused by too many baby pictures, and baby knits are best illustrated on babies. This reader desires more baby pictures. Completely fabulous! lol Love your Grammy posts. My daughter has not given birth, yet and I’m not quite as far gone as you with my perfect grandaughter from my son. She is amazing and wonderful but I think the daughter thing adds something. Something big. Cheers! You’re obviously going to be the best grammy for little Elliot that you can be and you will, no doubt, be lodged firmly and permanently in his heart as your grandmother is in yours. Cheers! Maybe you should just link your blog to insttagram for the next few weeks. We’d all understand! We expected you to do that, Steph. If you didn’t act this way, we’d think something was wrong with you. What a handsome face, and nice nice long fingers and great cheekbones. And that hat is to cherish…I bought the book, toot sweet. I’m happy everyone is so very pleased. For goodness sake, hire a cleaning service. You will be amazed at what it will do for your sanity as well as your marriage. Plus, someone will really want that job. It’s not selfish. Just remember that a tidy house is the sign of a dull woman. While an adored grandson (wearing gorgeous knitted garments) is the sign of an awesome grandmother. I’m in love with Elliot and his tootsies. Wish I were in Toronto to get some of that loveliness (yeah, get in line!!!) enjoy while he is little and let Megan get lots of rest by offering to take care of him for long stretches of time. Knowing you, you will figure out how to knit and hold at the same time. Keep posting pics – Never too many. Priorities. You have them right. And I’m totally tickled that your grandson is cloth diapered. Me, too! We used cloth for our daughter, who turns 18 in two months, and we were dinosaurs then! 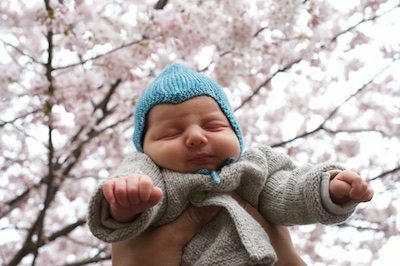 We’re the (Knitting) Blog, and we live for pictures of handknits, especially if they have adorable new babies in them. In your favor, it looks like the Frolic is in Toronto, so you don’t have to get on a plane. (I sure wish I lived in Toronto this weekend.) If you have to live in Crazytown for awhile, at least it gives you good material when you get time to write. We’re always happy to see you when you appear. For what it’s worth, the baby seems to be doing just fine! Three stay at home mommas love cloth so much they started their own company!!! Me too! Especially because, from here, it looks like I use the same ones. 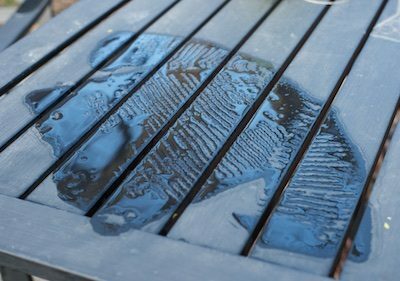 Easy to clean, easy to dry, sizes well, lasts forever. Also, adorable little baby feet! And the hat, and the little nose! The dust bison will eventually attract predators, so that problem is solved! Wonderful post! Love that hat and want to knit it for the next random baby, who happens by! I know you usually resist delegating tasks, but…maybe it’s time? He is truly adorable and has a fine future as a hand-knit model. Not that you asked, but why don’t you hire someone to give your house a quick clean, order a few groceries delivered, and then have your favorite restaurant meals delivered, too? Keep knitting those precious baby things! He is very adorable, and I’m glad you are so happy being a Grammy. I hope you find a new workable balance sometime soon. Yeah, he is pretty darn adorable. …hugging that grandson more before he takes the car off-road! Please, do post further updates as events warrant! That baby is adorable. That is one fabulous grandbaby in, of course, fabulous hand-knits! Dry toast and salad is a two-course meal! I once served my fiancé scrambled eggs in a cup because there wasn’t anything else in the house (and he still married me). Just remember, you’re never going to reach the end of your life and think “man, I wish I’d spent more time on the housework when Elliot was a baby.” Although it is possible that you may wish someone else had spent more time on it. After all, he’ll be crawling before you know it, and you don’t want him being trampled by a herd of dust bison when he comes to visit! That is my absolute favorite hat pattern in the world. Plus it is easy to bump up or down in increments of eight for larger or much smaller people (I am a neonatal RN and some of my newest friends are born very small). I have five grandchildren and the wonder never fades. So, just enjoy it and do not worry about any other thing. We’re not all sick of the baby pictures. Keep them coming, please! We’re not all sick of the baby photos. Keep them coming, please! You are doing a grand job… please keep the pictures coming! The only problem I can see is that the knitter doesn’t have more time to write blogs to entertain THe Blog. He is adorable, and housework is overrated. If the fridge smell gets too bad, just start chucking stuff and add baking soda. Carry on Grammy-ing. LOL. Grandma time beats cleaning time any day. Your daughter and new baby Elliott live close by. All chaos in your life and home are now irrelevant. I remember the feel of those tiny fold up legs, soooo incredibly soft … skin from another world. You could always pop tiny wonder into a mei tai and just keep knitting . Thank you! I was trying to remember the rhyme that I cross stitched for a friend years and years ago and couldn’t come up with it. That’s it, though, and I can return to my knitting with a clear mind. you are so “Us” – – we all lose track – especially with family needs. . . .thank you – – thank you – – thank you – – – – – – for being so normal – – and making us know that we are too . . . . There is no such thing as too many baby pictures. Ever. Freakin’ adorable indeed! Those cheeks! Those cheeks! Those feet! He’s such a cutie! No worries. Cuddle that sweet boy, meet those priority deadlines. We’ll ooh and ahh for a bit and see you when you get back. He is EXACTLY what you should be spending your time on! The Blog understands priorities, so no worries. Abso-freakin’-lutely adorable. I think we all expected a blog hiatus in the face of a new grandchild. Feel free to use the son of the World’s Greatest Knitwear Model as a model as often as you can. OH. MY. GOODNESS! In case there was any doubt, some of us in “the blog” (ok, probably all) have been checking daily for picture updates of the wee sir and his wee knits that we knew were coming. Of course they were worth the wait. But, please, don’t make us wait so long next time! As for as getting it all done, if I had a grandbaby-I’d drop everything and knit cute baby stuff until it was old enough to tell me to stop. I am so jealous! Fabulous! Darling! There is no higher good. Keep it up! Only fitting that the fabulous Elliot is working on his future sock modelling skills already. PS I am so happy for you! I just want to stroke those wee legs & play with those footsies!! Thank you for the vicarious Grandmother experience. I think the knitter absolutely has her priorities straight, this phase will not last & should be indulged to the maximum!! To make you feel better: I’m the oldest of 5 kids. When my mom was pregnant with the youngest, my parents put an addition on the house. Mom put the first coat of paint on the interior trim while pregnant with Becky. When Becky went off to college 18 years later, Mom had the time to put the second coat of paint on. My parents had their priorities straight. For some weird reason, this is the email that really brought tears to my eyes. That wonderful little bundle of love and adorableness has conquered Toronto. While it’s true that life sorta kinda eventually expands to contain all that additional love and adorableness, it’s definitely crazier at the start!. Those cheeks, that chin, that hat! LOVE!!!! 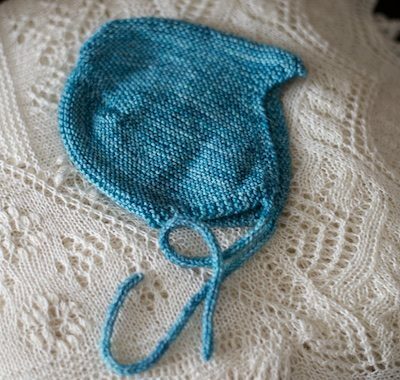 Is there anything sweeter than a baby in hand knits? I have a 6 month old. He is TOO OLD! You enjoy that tiny tiny baby. All that other stuff will happen again next year, but he is only that tiny now. I will wait. He’s absolutely adorable. Your daughter needs your encouragement and help right now way more than your floor needs to be clean. I don’t think I would have made it without my mom. Plus it wouldn’t kill your husband to do a load of laundry, just saying. Anyone who is sick of baby pictures should do the breath on a mirror test to see if they are alive! Yep. He is absolutely ‘freaking adorable. Since I have no grand babies of my own, he is possibly the cutest baby I have ever seen. Missed your blogs but knitting for him is far more important. Buy take out food and new clothes. The rest will come together somehow. Enjoy him. I, for one, will never, ever be sick of photos of Elliot. You may get an email from my two adult kids, though. I have been blaming you becoming a grandmother for my (possible incessant along with pics of baby knitting patterns) “occasional” requests for them to hurry up and make me a Grammy already. It can’t hurt to remind them, right? Enjoy that gorgeous little boy. Also, cloth diapers? Awesome. What advice would you give to your best friend in this situation? Cancel anything not strictly necessary, promise your friends you’ll see them in a bit, cleaning service, taekeoout…. Good luck with that, Steph. My grandgirls are 8 and 5 and my house still isn’t clean. My husband just got a raise, a big one. I’m calling in cleaning ladies this week because even my boys have noticed the state of the toilets. A brilliantly funny piece. Thank you Steph for finding the time to write it. What a truly adorable little guy. And I’m still looking at photos of the amazing blanket. My first set of grands are growing up fast and it maybe a few years before I get another, so I’m thinking I should start a blanket now. Just an aside, no one will remember bag salad and dust bisons, but you will regret every moment not spent cuddling while he’s still small enough not to squirm off your lap. He is adorable! Congrats and enjoy every minute! And thanks for the wonderful post. I’m still grinning! What the actual f***k? You are now a grandmother and the term “baby brain” is not reserved only for the wonderful new mum (as we say here in England) but for all of you who’ve just welcomed this miracle with liddle feetsies. I can only imagine that your brain is scrambled, remember when you were a new mum? All of those feelings are there again and even more so for your wonderful Meg. Thank you so, so much for sharing this amazing time with us, I probably won’t have grandkids of my own, but boy is your blog the next best thing! Plus, when can we start the sponsorship drive for the Rally? We knitters of the globe love to feel involved in the incredible things you do! Get used to it, our grands are 9 and almost 7. The world revolves around them. He is gorgeous and you have your priorities perfectly aligned. OMG HE IS GORGEOUS! And he is already an excellent knitwear model! Oh, I miss the smell of baby head. So sweet. So precious. Awww!!! Hold that baby and knit for him, Grammy. You have your priorities in order. Thank you and Meg and Alex so much for sharing your beautiful grandson with the Blog. We are the luckiest Blog in the world. I get to touch the foot! I get to touch the foot! Widdle feetsies!!!! OMG, what a brilliant post – I chuckled all the way through! And what an absolutely adorable little man swaddled in the cutest of hand-knits (and cloth diapers!). Enjoy this time with him now while you can – housework can certainly wait. Nobody ever died from a dusty floor or lack of clean clothes. I daresay. Enjoy being a Grammy, I know I do! My two GBs are 7 & 8 and still precious. And they wear everything I’ve knit for them . I get to touch the T-shirt! Thank you for sharing th photos of Elliott. He is gorgeous like his parents. I am so happy for you that you have become a grammy. Treasure the feeling and enjoy that beautiful boy. So cute! 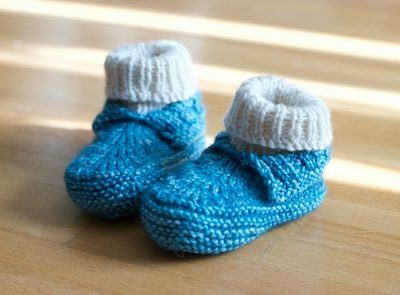 And thank you for the heads-up on the booties pattern–my three-day-old grandson needs something exactly like that and those are perfect. Your grandson is the most perfect model ever. Love, love, love this post! And, congratulations to your family for the little addition. Many congratulations to all the family in the birth of Elliott. I just love this post…hilarious writing, just priceless, it had me smiling and chuckling reading along. The best sort of blog post! Never, ever, ever sick of baby pictures. THERE ARE NEVER ENOUGH BABY PICTURES!!! My goodness! He is so wonderful! I am so happy for you all and isn’t he so precious it hurts!!?? I laughed so hard. Thank you. Dear Grandma: (Don’t you love how that sounds??) I became a great-grandma right when Elliot made his appearance. Our joy is tempered only by the fact that I live in San Francisco and Winston lives in Sweden. Can you believe that !?!?! I am so happy for you. Enjoy every minute with him and damn the dust bison. Wow is that little fella cute. I think it is totally reasonable and perhaps even necessary to take a 6-week break from everything else (except knitting). Enjoy this time with infant Elliot. It is important and you deserve it! Everything else will wait. Cute, cute, cute grandchildren cannot be hired, and their widdle liddle tootsies need to be warmed in a way that only you can do – so your priorities are completely correct. PS: That hat looks lovely, but I need to see if it matches his eyes. More photos required. Brilliant writer as always! Can’t get enough of your posts ! Love this post! Can’t wait to see more pics of that cutie, and his new kniits!! Welcome to the Club, Granny, Grandma, Nana, Mimi?? Look at those cheeks!! Why could resist kissing them if anywhere near being in close proximity? Not I. Enjoy your wee one — he deserves every ounce of love he can get. Good to see that your priorities are in good order. Lol It all settles in after a bit. Not to worry. oh, the cheeks on him! bless you all, Grammy. He’s not just adorable; he’s also clearly intelligent, perspicacious and talented. He totally deserves the wool/silk blanket! 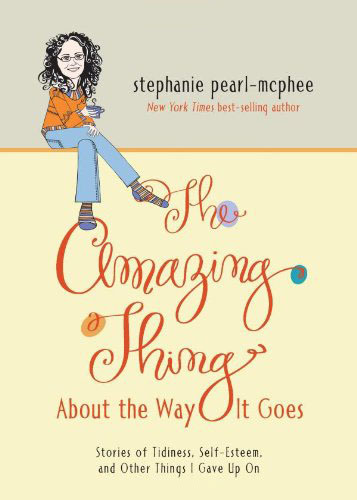 Stephanie, I totally grok your frazzled-ness. My dear DIL found a sweet little puppy, (a Chi-Woodle), that she offered me for an early birthday gift. I am flummoxed. I have to catch little knit times when the puppy has passed out in a play weary puppy heap. I don’t think I will be knitting sweaters for this leetle drag about. An old sweater (procured from local thrift store) blankie will do just fine. Here is the rest of the poem that someone referenced earlier. It applies to grandma’s too. Sew on a button and butter the bread. Where is the mother whose house is so shocking? She’s up in the nursery, blissfully rocking. Look! Aren’t his eyes the most wonderful hue? But children grow up as I’ve learned to my sorrow. So quiet down cobwebs; Dust go to sleep! F the dust bison and enjoy your grandson! They change too fast and this age (any age really) so enjoy enjoy enjoy! I love the beautiful things you have knit for him & he will know that he is loved. My son is eight and he has everything i ever knit for him – holes & all and keeps them in box for his kids someday. He is also known for his patience in yarn shops & for disappearing and bringing back armfuls of yarn he likes for his next sweater. Plus he just knit his first mini blanket for his bear. not only can you knit for your grandson – you can teach him to knit (i know you will) and then your fun will really double. I’m not sick of pictures with Elliot in them. Moar peeectures, pleaze! Oh, the feetsies are the cutest! Did somebody forget to tell you that you automatically get a 90 day grace period after the birth of your first grandchild? It’s a complete new terrain you must learn to navigate. Hold, play with, and spoil that baby to your hearts content and don’t feel guilty for a second! From experience, the solution is to PRIORITIZE!!!! And it appears to me that you have done that, Baby first, all else later. So cute by the way!!! I enjoy that in addition to knitting and Harlot life updates, this blog contains solid baby handling advice. Adorable babies are ALWAYS a priority . . . and all the good stuff every commenter ahead of me said. Okay. I think I’ve said this before. Maybe more than once. But, THIS IS MY FAVORITE BLOG POST EVER! LOL’ing fer realz here at work, as I stare down some pretty awful school deadlines. The Blog can be kept pretty happy with baby photos, though. Courage, mon amie! Oh the hilarity! Totally awesome! So glad they are cloth diapering! Pretty sure I was meant to be in your family! Grandma-Land is a place I’m unlikely to see for at least another ten years, or so my four children inform me. I’m so happy to live vicariously through you. 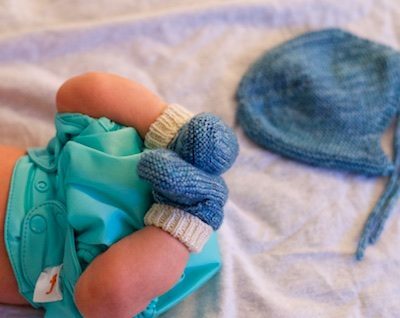 The tiny knits are so cute, and that baby is a little heartbreaker! That sweater puddle is utterly enchanting. Dear Steph, throw out most of those post-it notes RIGHT NOW! Just enjoy the precious moments amongst the chaos! These are once in a lifetime memories! Who said there are too many baby pictures? Anyway, Steph, this was my favorite post ever. And I say that a lot. But this was. My favorite post ever. Thank you for sharing the widdle baby feetsies and pictures and knitting and Meg – who, obviously, is the most wonderful woman ever – to the best grandbaby ever gifted to a grandmama. My cup runneth over. Or maybe it’s your cup? Whatever, We’ll share. After all, we are Blog. “Widdle feetsies” . I am ded, as my hed sploded right then. Widdle feetsies are just borderline bearable, but put them in adorable booties and they become hed-sploding cuteness. More booties, please! NO ONE is sick of the baby photos! Please keep bringing those our way. At least the knitter delivered a fantastic speech at The Frolic & does not have to move away for fear of embarrassment. I think “the knitter” in question has her priorities absolutely perfect. Life’s too short to do housework (to quote my sister-in-law). Do you have any tips for me? ?